The possibility of upward social mobility is one of the core ideas behind the ‘American dream’. However, even in a society that is considered highly mobile like the US, it is well established that socioeconomic status is largely determined by parental income and education. Recent work by Chetty et al. (2014) has found that in spite of improvements in social welfare and efforts to curb discrimination, only 8% of children born into families in the bottom 20th percentile of the income distribution during the 1980s succeeded in reaching the top 20th percentile for their age today. Moreover, research accumulated over decades in developed and developing countries shows that a substantial part of income and education is passed on from parents to children, generating significant persistence in socioeconomic status (Black and Devereux 2011, Solon 1992, Zimmerman 1992). Previous work on intergenerational transmission of socioeconomic outcomes has so far focused almost exclusively on income and investments in education and cognitive skills. Just as important is the intergenerational mobility in non-cognitive attributes, including individual’s physical and mental health, as these are also likely to provide important insights in understanding high persistence in economic status. Moreover, it is well documented that recent immigrants in a number of host countries around the world – including the US, Canada and Australia – have better health outcomes than their native counterparts with the same socioeconomic characteristics. This phenomenon is known in the US as the ‘Hispanic paradox’ and more generally as the ‘immigrant epidemiological paradox’ (Baker et al. 2015, Antecol and Bedard 2006). Thus, it is of interest to examine whether the persistence of health outcomes changes as immigrants remain in their receiving country for more generations. Using data from the National Longitudinal Survey of Youth (NLSY), we provide new evidence on intergenerational transmission of health status for natives and immigrants and for different immigrant generations in the US (Akbulut-Yuksel and Kugler 2016). More specifically, we examine the extent of intergenerational transmission in a broad set of health outcomes including weight, height, body mass index (BMI), occurrence of asthma and depression. We address two questions about the intergenerational transmission of health status. First, we examine the extent of the intergenerational transmission of health for natives and immigrants and ask whether these intergenerational correlations differ between natives and immigrants. Second, we investigate whether those who have been in the US for various generations have lower intergenerational persistence in health outcomes compared to more recent immigrants. Related to this point, we ask whether immigrants resemble natives more in terms of health outcomes as they stay in the US for more generations. To answer these questions, we use a nationally representative dataset, the NLSY, which follows mothers from 1979 through to 2004 and their children who are older than 15 from 1994 through to 2004. The fact that the NLSY follows mothers and children through time enables us to link mothers’ and children’s health outcomes and demographic characteristics, and observe both generations at the same stage of their lives, which is essential for the purpose of our paper. Figure 1 presents the intergenerational persistence coefficients for the anthropometric measures. We find that 50% of the mother’s weight is transmitted to native children and 70% to immigrant children. Figure 1 further shows that native children attain 40% of their height from their mothers, whereas the corresponding association for children of immigrants is 47%. When we combine weight and height, we find that children of native mothers attain 45% of their mothers’ BMI, while children of immigrant mothers inherit 58% of their mothers’ BMI. 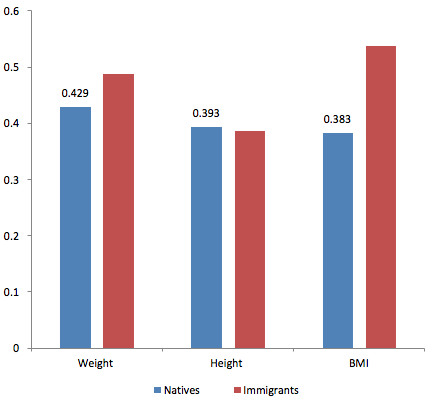 Thus, comparing the persistence coefficient between natives and immigrants indicates that the persistence in BMI is significantly greater for immigrants. Our estimates of intergenerational health persistence are comparable to recent education persistence estimates found by Hertz et al. (2007). Given the well-established causal link between health and labour market success, our findings highlight the importance of parental health capital in transmitting health endowments to their children as well as in understanding the strong persistence in socioeconomic status across generations in the US. 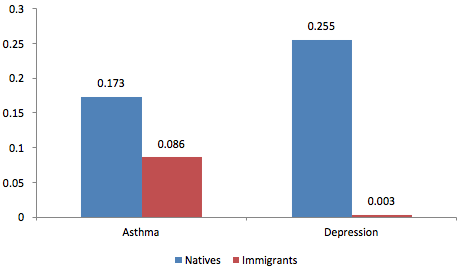 Figure 2 also shows the intergenerational transmission of asthma and depression across generations for natives and immigrants, respectively. We find that the association between mother’s incidence of asthma and a child’s incidence of asthma is approximately 17% for native children and 22% for immigrant children, although these persistence coefficients are not significantly different from each other. By contrast, Figure 2 shows that depression is less pronounced for immigrants. If a native mother reported being depressed in 1992, her children are also on average 8% likely to feel depressed in 2004 compared to children of non-depressed mothers, suggesting intergenerational transmission of mental health across generations. By contrast, there is no evidence of any intergenerational transmission of depression among immigrants. We are also interested in whether children are affected more by other environmental factors and less by their mothers’ health as they remain in the US for more generations. Indeed, Figure 3 shows that the longer immigrants remain in the US, the smaller the persistence coefficient in health status is and the less their health status is determined by their mothers’. 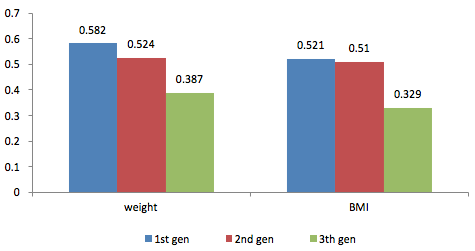 In particular, we find less persistence in weight and BMI for the third-generation immigrant children than for second and first generation immigrant children. In fact, we find that third-generation immigrant children show a tendency to resemble native children more. The tendency towards higher weight and BMI are, however, not necessarily positive since these make immigrant children more likely to be overweight. This is consistent with earlier work that indicates that acculturation and the transition of immigrants towards less healthy diets may impair the health advantages of early immigrants pointed out above (Jasso et al. 2004). We find evidence that there is substantial persistence in health status for both natives and immigrants. Between 50% and 70% of children’s BMI is inherited from their mother, but immigrant children’s weight and BMI tends to resemble that of their mothers more than native children’s weight and BMI do. By contrast depression is more persistent for native than immigrant children. Importantly, we find that as immigrants remain in the US for more generations their children’s health tends to resemble their mothers’ health less and less and to instead resemble native children’s health. Unfortunately, since recent immigrant arrivals tend to have healthier habits, this means that as immigrants assimilate they tend to look less healthy as well. Akbulut-Yuksel, M, and A Kugler (2016), “Intergenerational Persistence of Health: Do Immigrants Get Healthier as They Remain in the U.S. for More Generations?”, Economics and Human Biology. Antecol, H, and K Bedard (2006), “Unhealthy Assimilation: Why do Immigrants Converge to American Health Status Levels?” Demography, 43 (2), 337-360. Baker, E, M Rendall, and M Weden (2015), “Epidemiological Paradox or Immigrant Vulnerability? Obesity among Young Children of Immigrants.” Demography, 52 (4), 1295-1320. Behrman, J, M Rosenzweig, and P Taubman (1994), “Endowments and the Allocation of Schooling in the Family and in the Marriage Market: The Twins Experiment”, Journal of Political Economy, 6 (102), 1131-74. Black, S, P Devereux, and K G Salvanes (2007), “From the Cradle to the Labor Market? The Effect of Birth Weight on Adult Outcomes”, Quarterly Journal of Economics, 122 (1), 409-439. Borjas, G J (1992), “Ethnic Capital and Intergenerational Mobility”, Quarterly Journal of Economics, 107 (1), 123-150. Chetty, R, N Hendren, P Kline, and E Saez (2014), “Where is the land of Opportunity? The Geography of Intergenerational Mobility in the United States”, Quarterly Journal of Economics, 129 (4), 1553-1623. Hertz, T, T Jayasundera, P Piraino, S Selcuk, N Smith, and A Verashchagina (2007), “The Inheritance of Educational Inequality: International Comparisons and Fifty-year Trends”, The B E Journal of Economic Analysis and Policy, 7 (2), 1935-1682. Jasso, G, D Massey, M Rosenzweig, and J Smith (2004), “Immigrant Health, Selectivity and Acculturation," in N B Anderson, R A Bulatao, and B Cohen (eds. ), Critical Perspectives on Racial and Ethnic Differences in Health in Late Life, Washington, DC: National Academy Press, 227-266. Solon, G R (1992), “Intergenerational Income Mobility in the United States”, American Economic Review, 82 (3), 393-408. Zimmerman, D J (1992), “Regression toward Mediocrity in Economic Stature”, American Economic Review, 82 (3), 409-429.